DETROIT -- Ford Motor Co. is adding a second V-8 engine option and upping the power on its Super Duty pickups to maintain its segment dominance halfway through the vehicles' life cycle. The 2020 F-250, F-350 and F-450 pickups, scheduled to go on sale this fall, will offer an optional 7.3-liter V-8 engine in addition to an updated third-generation 6.7-liter Power Stroke diesel and the standard 6.2-liter V-8. They will be paired with a new 10-speed automatic transmission. Although executives declined to offer specific figures, they said the new powertrains will improve power, payload and towing capability, critical stats for the construction workers and fleet operators who most use the vehicles. Ford has adopted the "We Own Work" slogan for the Super Duty, which leads in sales and market share but faces increased competition from new offerings by Ram and Chevrolet. Ford last redesigned the Super Duty for the 2017 model year, when it shed as much as 350 pounds by switching to an aluminum body. The midcycle freshening comes as Ford shifts 90 percent of its capital allocation to producing pickups, vans and utilities. By 2020, roughly 75 percent of its lineup will be updated or new. "Fundamentally, we're playing to our strengths," Kumar Galhotra, Ford's president of North America, said at a media briefing. The 2020 Super Duty's new 7.3-liter engine is expected to be the most powerful gasoline V-8 in its class, Ford says. Its overhead valve architecture has a cast iron block and forged steel crankshaft. Ford will offer a compressed natural-gas conversion option. The third-generation Power Stroke diesel will be Ford's most powerful. It has a stronger cylinder head, block, connecting rods and bearings to handle higher cylinder pressure and increased output. It includes a new 36,000-pounds per square inch fuel injection system with new injectors that Ford says precisely meter and spray up to eight times per stroke to control noise levels and optimize combustion. The 10-speed transmission, which replaces a six-speed, is better for towing, Ford said. 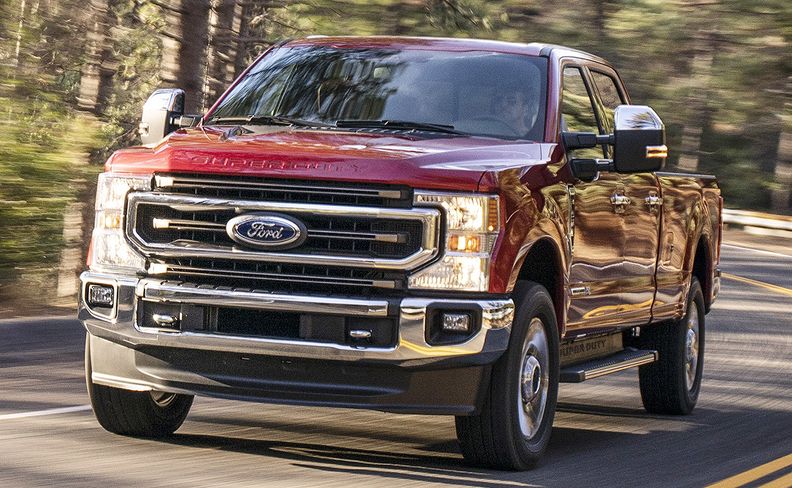 It said the Super Duty will be the only vehicle in the segment to offer live-drive power takeoff, which allows the operator to engage industrial equipment and accessories such as snowplows while the vehicle is in motion. Aside from the powertrain improvements, the 2020 Super Duty gets exterior updates that include a revised grille, as well as interior and technological enhancements. The vehicle will come with an optional pro-trailer backup assist feature that is used on its smaller F-150 sibling. The feature lets drivers steer the trailer with a reverse camera that can handle all trailer styles, including fifth wheels and goosenecks. It also includes lane-keep assist, emergency braking with pedestrian detection and blind spot monitoring technology. The features are standard on XLT and higher trims. Ford also added new drive modes, including Eco, Slippery and Sand/Mud. It also comes with an embedded 4G LTE modem and Wi-Fi. In addition to the grille, which improves cooling, the truck has a new tailgate design and updated headlights, taillights and bumpers. Ford did not disclose fuel-economy figures or pricing.